Digital Jewelry is a premier jewelry designer and manufacturer. Get quality customized badges, medals, rings & all jewelry products. 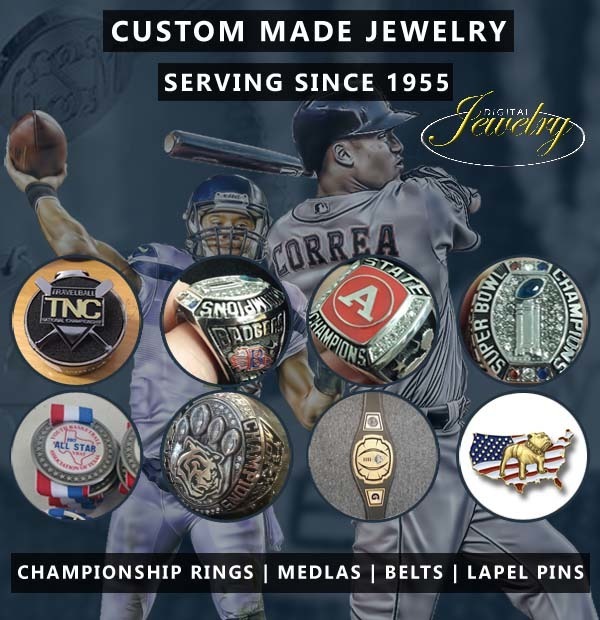 Custom designer and manufacturer of Custom Championship Jewelry and Awards - a business-to-business and on-line business model. Digital Jewelry quality products are designed with 21st century digital technology, and founded upon late 19th century Italian craftsmanship. The company’s founders with over 100 years of expertise are the sons and daughters of an Italian craftsman/artisan who came to America through Ellis Island, NY in the 1940’s with a vision of fulfilling “The American Dream.” seventy years later that vision still exists, now with a global presence. Digital Jewelry is a take off of the family business with a continued commitment to designing jewelry of timeless beauty for life’s most important moments and memories. I believe that through sheer hard work, patience, perseverance, tolerant of the hours of work, sincere service and timely delivery of HIGH QUALITY products, worthy of recognition, the price of triumph is a sweet success. This principal has been passed on to myself and the rest of my brothers and sisters by my father, Ivo Colucci. This has now become the Mission Statement for our company!